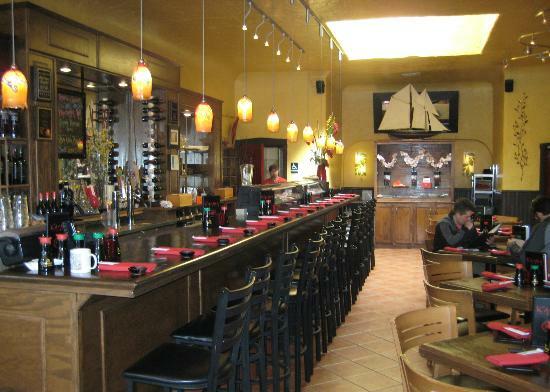 I remember when Karma Sushi first opened thinking, "Wow, this is a pretty fancy-schmancy sushi place for Flagstaff. I hope the sushi is good." Happily, it is. 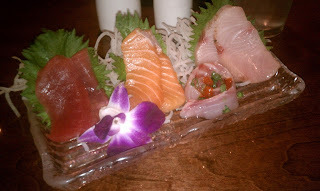 Karma is a non-traditional sushi restaurant, more aligned with the American upscale, lounge-type sushi restaurant. It is usually very busy on weekend evenings, filled with younger parties on dates or "friends night out." There are a TON of rolls on this menu. Lots of creative ones, even though I think there are too many with cream cheese. (One of my pet peeves is cream cheese in sushi.) It's also the only place in town to get traditional ramen, which I love. The appetizers are "Japanese tapas" and also provide a nice spin on traditional flavors. The fish is always fresh, and the servings tend to be generous. I also love that you can get fresh wasabi here--the flavor of the grated root is so much more delicate than the powder. It's worth the upcharge. Side note, it really tickled me to see the Black Cat Roll on the menu, which pays tribute to one of the prior tenants of this space, the Black Cat Cafe. Mike Purcell, who was a generous contributor to several nonprofit organizations with which I was previously affiliated, was the owner of the Black Cat Cafe. While I'm not sure he ate sushi, I'm sure he would appreciate Chef/Owner Steven Scully's tribute to his restaurant. Lots of creative cocktails here, but most of them tend to be on the fruity and sweet side, which I don't think is a good match for the fish. Pretty basic wine selection, and a small sake menu. Big city sushi place in a small town.